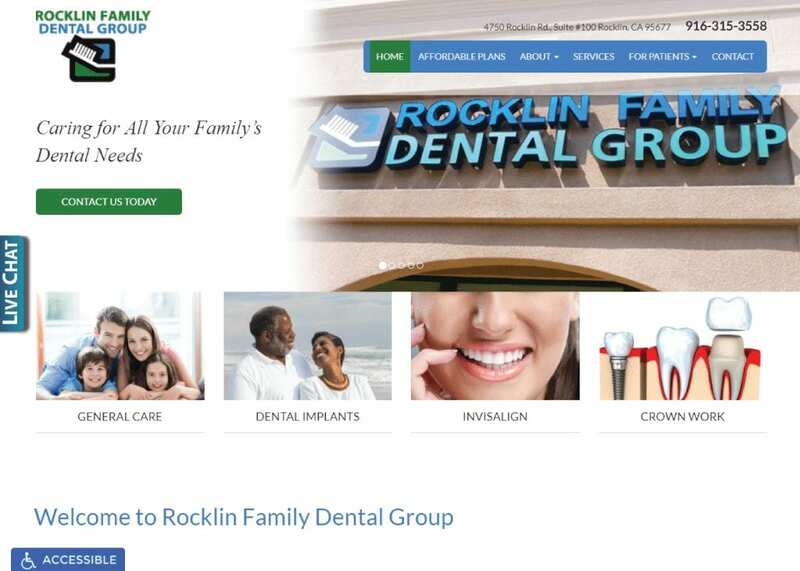 Rocklin Family Dental approached us looking for a new design for their website. Throughout they asked that we focus on their dedication to providing a pleasant and inviting office, with a staff that is dedicated to a comfortable and enjoyable experience. We worked with them to produce the following results, and we believe we’ve managed to capture exactly what they were looking for. A website that is approachable and displays their dual qualities of professionalism and comfort, and is easy to navigate. We went with a more straightforward design for their website, focusing on bright, cheerful imagery that demonstrates the diverse nature of their practice and the community they serve. The dental website opens with a series of available links, the practice’s address, and a phone number to make it easy for visitors to make a quick connection with the clinic and set up an appointment. We also wanted to put the location in their mind, in part due to the attractive nature of their building, and so put that prominently in the opening slideshow. The white base of this website emphasizes the purity and professionalism of their clinic, while the blue tones are used to help highlight a sense of relaxation and hope. This color combination is common for dental and medical practices and those that deal with conditions that are often stressful for the patient due to the calming effect they’ve been shown to have on viewers. The green tones compliment the blue and white nicely, but also impart a sense of ‘growth’ and ‘luck’ that help to encourage the prospective patient as well as enhance the effectiveness of the other tones used. As you scroll throughout the website, you’ll notice that these colors are present in just about every stage, from the backgrounds in the images to the design of their logo. The home page for Rocklin Family Dental is very light on textual content, focusing on the application of imagery to show potential patients the style of the office they’ll be visiting. These images introduce you to the staff, show you the office, and show you the potential results of the services you’re about to experience. The limited text that is used focuses on the staff and their backgrounds, introducing you to them and inviting you into their family. Aside from a relaxed approach that makes the various contact points for the dental office easily accessible, one of the most effective marketing elements on this website is the video that welcomes you to the Rocklin Family Dental Group. Videos help make the staff and the entire office real to the visitor, helping them to imagine themselves in the facility, which is one more step towards them making a call and setting up an appointment. A caring, family-oriented facility that has experience working with people just like you. Here you’ll find subtle undertones that indicate they know their community and are interested in forming lasting relationships with them. Even the introductions to the staff show emphasis on their primary concern being their patients and the people they serve, rather than the fears that plague them.